Inner and outer knowledge / Ebook/educational publication, available on request. Introduction to: The Best of a Sociology Wiki, by The Homeless Photographers / Phft2D 2014/2015 – Sociology Course 1/Royal Academy of Art in The Hague, NL. Published 29th January. Sometimes I think I torture art students: I ask them to read and write. My stubborn attitude stems from one clear vision: words are helpful to obtain deeper knowledge about human behaviour and society. A wealthy social scientists’ reservoir of books is waiting for us and I feel rich to have access to these texts. This is what I want to share. This social constructivist attitude has two important and practical implications. The first and comforting implication is that you can always ‘discover’ and construct. When you for example read a classic, your interpretation can be new, because you confront the book with your thoughts and experiences which are different from generations before you. This makes the argument that everything has been invented already redundant: every reading becomes a new knowledge experience and every generation will occupy old themes in new ways. One can taste this by reading student’s work on the experienced difference between culture and religion, or the difference between primary and secondary groups. The second implication is a lot less comfortable. Construction of knowledge demands hard work and you must be prepared to read with inner and outer participation. Inner participation means you bring in something of yourself. Outer participation means you must be prepared to be hungry for knowledge from the outside, must be be prepared to drink books, understand them, let them touch and confuse you, digest difficult stuff and write down your discoveries. What is the Sapir-Whorf-thesis? What are the evolutionary stages of the history of mankind? Why are social roles so important? The following texts are confrontations between students’ growing mental autonomy and knowledge. They were written during a short introductory course on Sociology for documentary photographers (2nd year) in which we ate and digested one chapter a week of the book ‘Sociology‘ by John Macionis and Ken Plummer (Pearson 5th Edition UK 2011); the Dutch version: ‘Samenleving‘ by Macionis, Peper and Van der Leun (Pearson 2014). Students selected a topic they were genuinely interested in, wrote a short article and posted it in a Wiki (digital classroom by Edu2.0). In 55 days this class wrote 87 articles. Students themselves selected their own favourite self-written article, which makes this Wiki-in-E-book-form a ‘The best of’. I would like to thank all writers for sharing their first and second thoughts on sociology. The Royal Academy of Art in The Hague provided us with the opportunity to practice knowledge construction and I am grateful to Corinne Noordenbos, Lotte Sprengers and my colleagues for their engaged power to educate. An important note: this publication is an educational publication. Only obvious language mistakes were corrected but without professional editing. One of the students was a native English speaker. No scientific rules were regarded in view of citing other authors. So whenever you recognize any quotes from other works, please take this as a compliment for the ideas of this particular author or thinker. This teacher selected the comments and turned beautiful expressions into bold (letter types). The conclusion of this Wiki-experiment? This was no torture, this was fun. And also a special form of non-material happiness. Published 29th January: Ebook / educational publication, available on request. 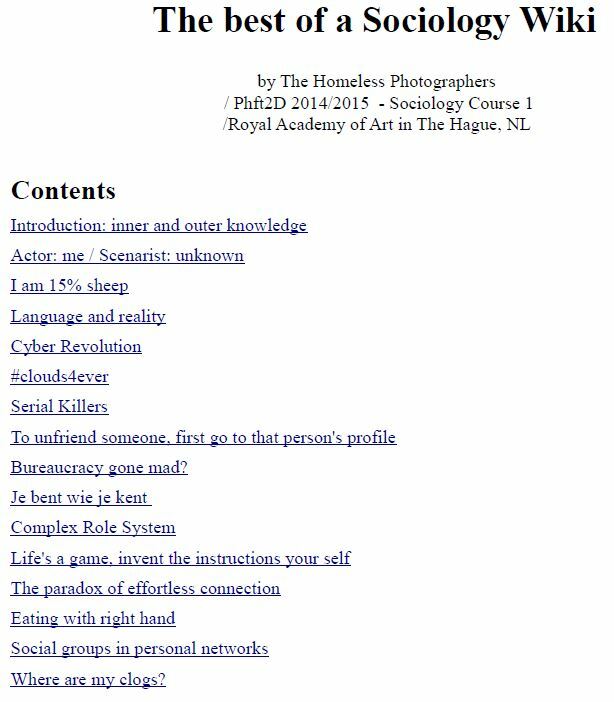 Introduction to: The Best of a Sociology Wiki, by The Homeless Photographers / Phft2D 2014/2015 – Sociology Course 1/Royal Academy of Art in The Hague, NL.